Iceland is a truly mystical island. The stunning scenery, with its many hot springs and geysirs, volcanoes and waterfalls and its rugged, rocky coastline lends itself perfectly to the many folk tales that abound. Such tales are deeply embedded in Icelandic culture, and surveys have shown that well over half of all Icelanders believe in the existence of the ‘hidden folk’. So just who are these ‘hidden folk’ or huldufólk? In Iceland – and also in the Faroe Islands – the term refers mostly to the elves and trolls, although belief in fairies, gnomes and ghosts is also widespread. One of a pair of trolls in Reykjavik. Engraving of a man jumping after a woman (elf) into a precipice. From the Icelandic legend of Hildur, Queen of the Elves. Artist: Johann Baptist Zurecker, 1815-1876. Public Domain. Giant at Geysir. The term ‘giant’ is often used interchangeably with ‘troll’ in Iceland. Our guide on one of the tours we went on informed us that in a recent survey, 80% of Icelanders professed to believe in (or at least, they refused to deny) the existence of elves and other hidden beings. Most sources I’ve read online tend to have the figure around 54%, which may simply be based on an earlier survey. But 80% is staggeringly high. Of course, many people worldwide hold beliefs in magical creatures, although it’s generally in the name of ‘fun’. Dragons and unicorns, ghosts and fairies etc. are common topics in many fantasy books and films. In Britain, if something goes wrong, or something disappears, we jokingly blame it on the ‘gremlins’. And in Ireland, we have belief in the leprechauns, another type of fairy, or pixie. But in Iceland, the hidden people are taken much more seriously. The origin of such strong beliefs revolves around Iceland’s geographical isolation. At such high latitudes and out there in the middle of the Atlantic Ocean, with the rest of Europe and North America so far away, life on the island changed little in hundreds of years. Although things have changed greatly in modern times, until little over a century ago, most of the population lived in turf houses, farming and fishing for their living. And with this simple, age-old way of life, superstitions and beliefs from long-gone times, lingered on. Even the Icelandic Christian Church condones these beliefs. 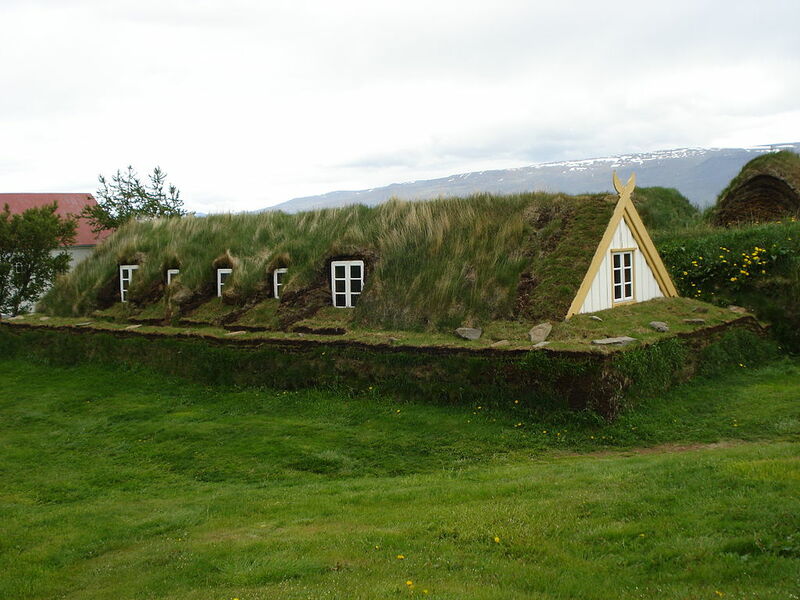 Turf house in Glaumbaer, Iceland. Author TommyBee. Public Domain. The huldufólk are common topics of conversation among Icelandic people. To upset the elves – particularly by disturbing their homes – can lead to very strange happenings. For example, engineers have been forced to divert the planned routes of roads in order not to disturb the elves. Álfastein in Kópavogur in Álfholsvegur 125. Elves to live here, which is why the road here narrows. Author: Christian Bickel. Creative Commons. Trolls are another feature of Icelandic culture that can be seen all over the island, inside and outside of souvenir shops as well as across the countryside in rocky places. They can be seen along the rocky coast, too, as stacks out at sea as well as in the cliffs. Because, you see, many trolls are simply dead! Trolls are creatures of the night, doing their work and enjoying themselves in the hours of darkness. But as soon as the sun comes up, like vampires, they must rush indoors and sleep. To be caught in the sunlight means certain death: they are turned to stone for all eternity. Wow, I did not know much about trolls, they seem to be cute and a bit scaring as well. Trolls are weird things, aren’t they? It seems that some can be nice and friendly and others cruel and nasty. I think that stories about the trolls coming for naughty children would certainly frighten kiddies into behaving well! Thank you, Ann. I have always believed in the existence of elves (shhh, don’t tell anyone). One of my first memories is of seeing a band of elves walking outside the front window of our home. I was a little under 3 years old and had never heard of them, nor did I know the name for what I saw. I tried to explain it to my parents, but they didn’t believe me. However, I will never forget what I saw! Thanks for keeping my secret. But it does make you wonder – how many out there have a similar secret…?? Wow, 80% might hold those beliefs! How interesting. I am enjoying these posts Millie. Thanks for taking us on this adventure! By the way, I love that turf house! That particular turf house is a good example of what many in past times looked like. Only a few are left nowadays. They were very effective at keeping out the cold, I believe, and made use of available materials. There have been few trees on Iceland for several hundred years. Thanks, Antonia. This is so fascinating Millie. I love that Turf House pic ! and as for Trolls, I had no idea ! I only knew of the ugly troll in The Three Billy Goats Gruff book, who used to gobble up all the people trying to cross the bridge! Many of us grow up knowing the story of the Billy Goats Gruff, and know little, if anything about trolls. They’re a very Scandinavian thing, and Iceland was first populated by Norwegian Vikings, so the stories about trolls (and elves) went with them. I agree, it is fascinating to know that such beliefs linger on today and hear some of the stories still told. Thank you, Lynne. Fascinating post — I am loving Iceland more and more! I just spent an inordinate amount of time learning more about turf houses and how they are built. What a creative adaptation to the climate. I love the trolls, too — every culture has their own mysterious magical creatures, but these seem especially colorful! Yes, I’m fascinated by the turf houses, too. They’re a wonderful adaptation to both climate and lack of timber. All other Nordic countries relied on timber for their houses – or wattle and daub, which is still wood, of course, but not planks of it. And I agree, nothing beats traveling there in person. That’s great, Joy. After all the time you spent looking things up you can put it all to good use. I agree, the use of turf for house building in latter-day Iceland was definitely more to do with the lack of trees than how cold it was, so if that idea fits your plains area, I’d say make good use of it. It will add interest for your readers. Well, this isn’t actually in “the book.” I’ve mentioned before, the current WIP is a haunted house story set in one particular region of Layor, so the vast majority of world-building that I do has to wait for some other story if it’s going to be included. I’ve just been directed here by a fellow blogger. Serendipity. This so fits in with the research I’m doing prior to writing my next story. I’m delighted that you visited my post, crimsonprose, particularly on the recommendation of another blogger. I hope you find the information useful for your research. (There are also several more DVDs on YouTube). The stories of elves and trolls in Iceland are fascinating and Iceland itself is a magical place. The dancing aurora adds to that feeling, too. I’d love to read your story once you’ve finished it. Best wishes, Millie. You got here — I knew you’d love it! Having been there, I think some do believe – but I also think Icelanders are smart enough to use this to captialize on the tourist interest it generates. They are superstitious however, but I think 80 % is stretching it. Did you hear about the Yule lads whilst you were there? Oh my goodness, I have missed so many posts! This one and the videos are stunning. I believe in everything these people say.